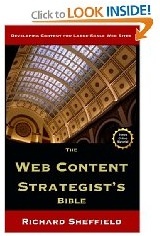 Thank's for mentioning the basics for a content strategist. If you have a social media site or blog that people direct questions or comments to, you need to be in touch daily, even multiple times a day. That could mean having a dedicated person whose sole responsibility is to respond – basically a customer-service person whose answers become part of the content of the site. Your post makes sense.I have interest in content strategy and I am delighted to come across this post of yours mentioning ways to know who to hire.